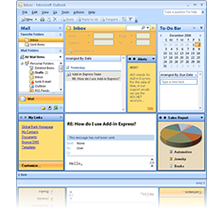 Messaging services that give you the power, functionality and security of the Microsoft Exchange Server. ExchangeMail from Alentus is an advanced suite of messaging services that gives you all the power, functionality and security of Microsoft Exchange Server, the No. 1 corporate messaging server. Account setup is a breeze and our industry leading Exchange Online Control Panel lets you add and remove services as needed so you are only charged for the services you use. Step up to business class messaging today with Alentus Hosted Exchange and you'll never look back. Every workforce is different - Do you have a geographically diverse sales team that requires full Blackberry integration. Or a handful of executives who need wireless and a handful of support staff who just need email. We're Experts - Our Alentus ExchangeMail Experts will help you in the selection and support of a hosted exchange solutions that are tailored to your organization's requirements. Discounts - Available for organizations with over 20 mailboxes. Contact our Sales Department for information.